Town in Silesia; formerly the capital of the duchy of the same name. Jews settled there about 1324, chiefly because it was situated on the commercial route to Breslau, in which place a colony of Jews had long resided. The Jewish community of Brieg had its separate place of worship from early times. In the fourteenth century the Jews of Brieg were persecuted on account of their usurious practises; and in 1392 it was claimed that all debts of the duke had been discharged by the payments to Jacob, the son of Moses, a Jew of Brieg, of a certificate of indebtedness. In 1398 the Brieg Jews bought a letter of protection from the duke, whereby they were guaranteed the peaceful possession of their privileges. But in 1401 they were driven from the city, except Jacob and Seman von Reichenbach, who had received a patent of protection from the duke's council for six years from May 1, 1399. Solomo, a capitalist, lent large sums of money to royal houses in the fifteenth century. With the decline of Breslau as a trade center, the Jews of Brieg became little more than an isolated community; and in modern times they shared the lot of the other Silesian Jews. They carried on insignificant trade operations as a rule. The conquest of Silesia by Frederick the Great wrought but slight change in their condition. 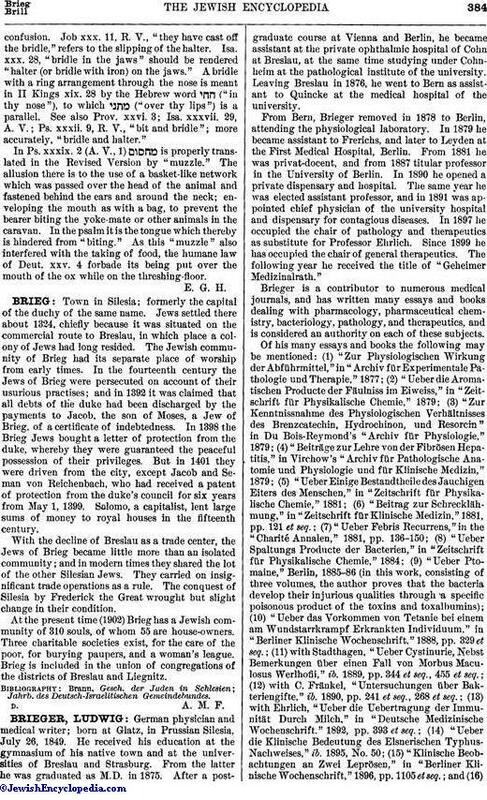 At the present time (1902) Brieg has a Jewish community of 310 souls, of whom 55 are house-owners. Three charitable societies exist, for the care of the poor, for burying paupers, and a woman's league. Brieg is included in the union of congregations of the districts of Breslau and Liegnitz.